One of my favorite meal prep things to do is to make a giant pot of fluffy-amazing short grain brown rice. With that pot, I can whip up a wide variety of meals in a flash! 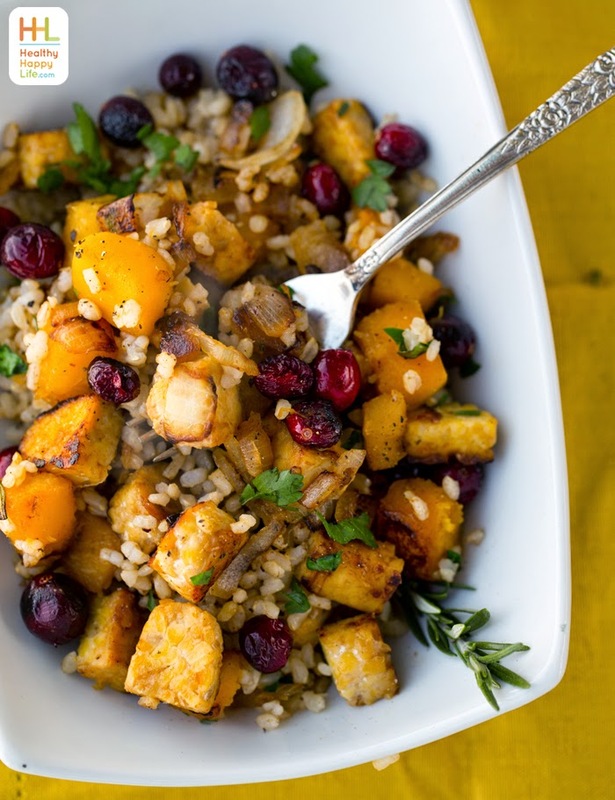 Fluffy brown rice absorbs flavors beautifully and it is so soothing and satisfying. 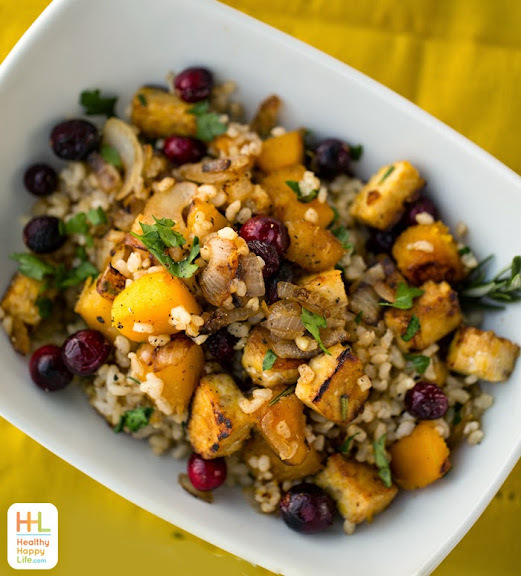 This festive, vegan Butternut Squash Cranberry Tempeh Brown Rice Bowl has flavors of cinnamon, orange, maple and rosemary. It is simply dreamy! 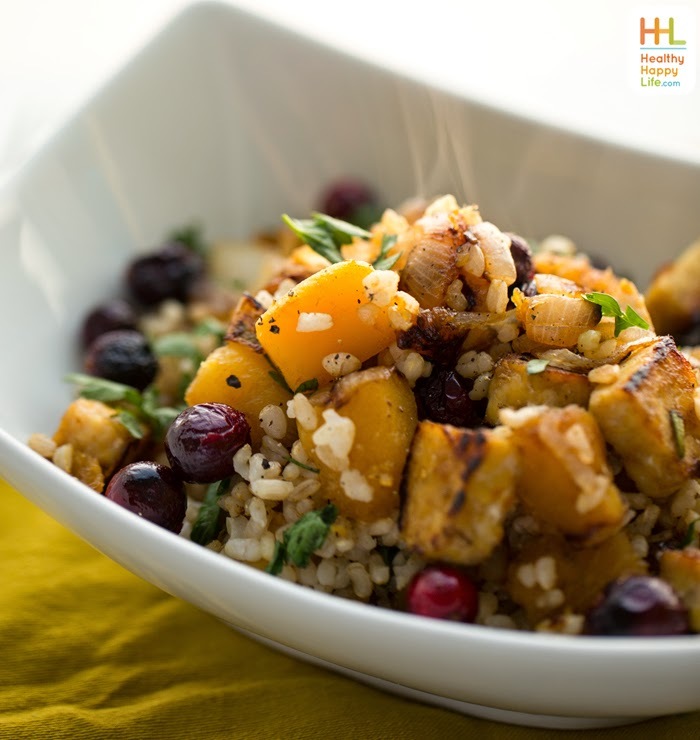 And perfect for the holiday season with those perky red cranberries adding a tart punch of flavor. Get my recipe and I have a fun holiday announcement for you.. 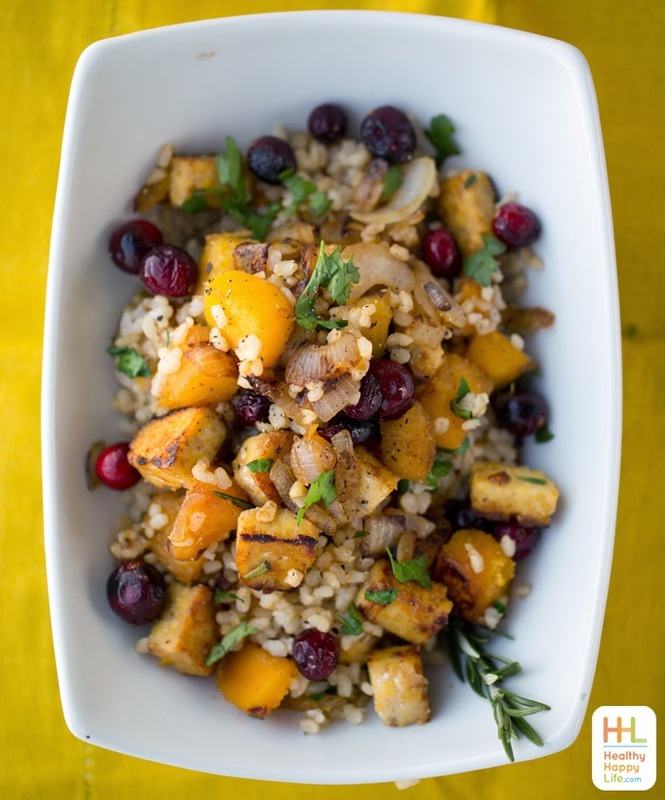 This one bowl wonder meal is a holiday lifesaver! Fast and easy, perfect for your busy month..
Not into Rice? Change it up! 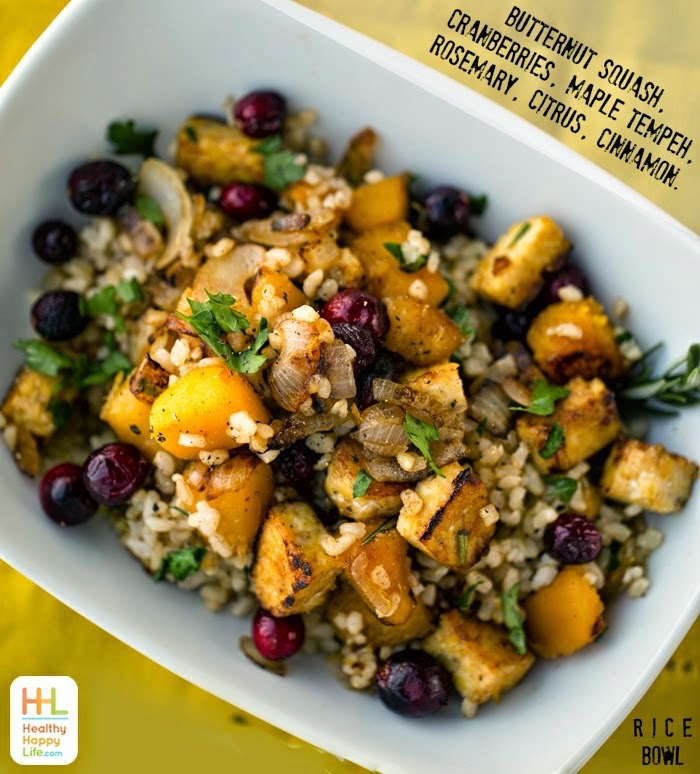 You could easily replace the rice with quinoa, millet, barley, farro, buckwheat and more! 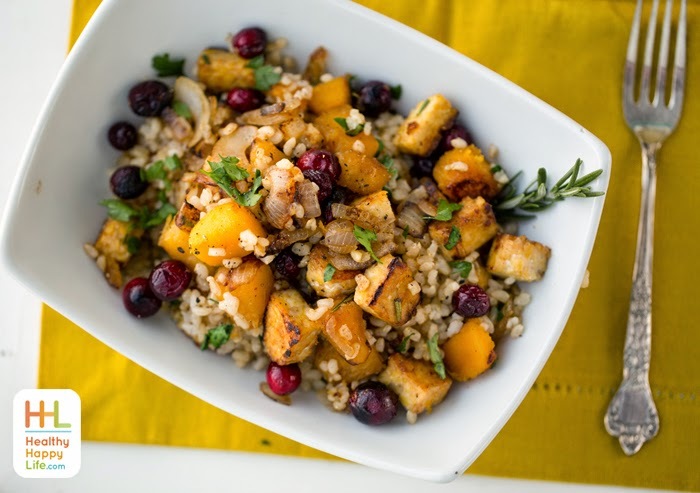 This holiday-approved entree is a one bowl wonder that you can whip up in minutes with cooked rice. The flavors are amazing: citrus, maple, rosemary, cinnamon. rosemary: add 1-2 pinches of finely chopped rosemary to the skillet - or sautè with a whole rosemary sprig and remove before serving. Warm a skillet over high heat. Add the oil, EVOO or virgin coconut. When the oil is hot, add the onion, tempeh, maple syrup and frozen squash. Allow to brown and heat for 2 minutes. If using fresh squash, you may want to lightly boil and drain squash before sautèing - this will help it cook and soften much faster. Add in all the remaining ingredients to the hot skillet, except the rice and parsley, and stir for another 2-3 minutes, if the pan gets too hot and ingredients start to over-brown, turn heat down to medium. Lastly, fold in the rice and parsley. Sautè for another 1-2 minutes to warm and lightly toast the edges of the rice, allowing the flavors to mix and mingle. You can also season and salt to taste here. Serve warm with some added fresh parsley over top for color. Prep Time: 00 hrs. 08 mins.